Workers who are building a controversial apartment complex on the banks of the Gowanus Canal are parking on sidewalks, say neighbors, and they haven’t stopped despite multiple warnings and tickets from police. “They just park on the sidewalks every day,” said Michael King, who lives on Second Street, across from developer Lightstone Group’s still-rising building on Bond Street between First and Second streets. King has made a dozen 311 complaints about illegal parking over the past two months, which have resulted in cops issuing two fines. Officers initially met with workers to give them an opportunity to move their trucks off the pavement and away from fire hydrants before laying down the law, but when the problem persisted, authorities began issuing summonses, according to a source at the local police precinct. 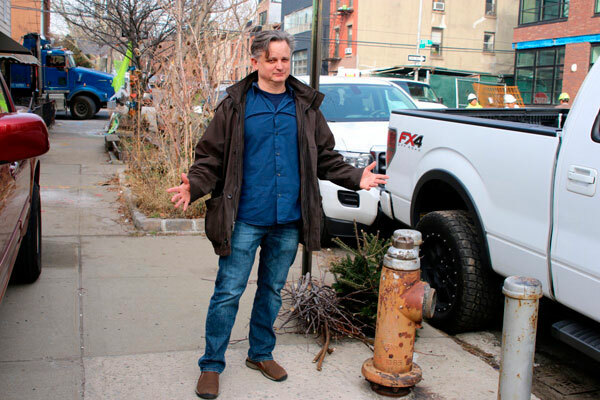 Gowanus resident Michael King is fed up with workers at the Lightstone development in Gowanus parking on sidewalks in the neighborhood. Photo: Steve Schnibbe, Brooklyn Paper.